At the heart of our commitment to creating a truly care-free landscape for our clients is our ability to provide both design and installation services. Our owner Danny Scroggs works with each client to create a landscape design that is both beautiful and within budget. In addition, we are experts at creating eye popping residential and commercial landscapes that utilize trees, shrubs and flowers that thrive in the Western North Carolina region. 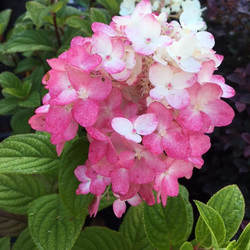 Knowing not only what plant varieties work in our area, but also which of these will thrive in your specific site conditions enables us to advise our clients on creating the most beautiful landscape possible. Take a moment to see some of the varieties of trees, shrubs and flowers we often recommend to our clients. When you're ready, please contact us for a complimentary assessment of your landscape. Remember, Asheville landscape installations are not just for spring and fall. In the south, landscape additions can be done year round, even in winter, as long as the ground is not frozen! Contact Us Now to Schedule a Free Landscape Design Assessment. Here are some of our favorite shrubs that thrive in the Western North Carolina Region. Take a look! Here are some of our favorite perennial plants that thrive in the Western North Carolina Region. Take a look! Here are some of our favorite trees that thrive in the Western North Carolina Region. Take a look!